In order to use our maps, you need to know the size of the map in a measurement that will scale the map to Roll20’s scale. 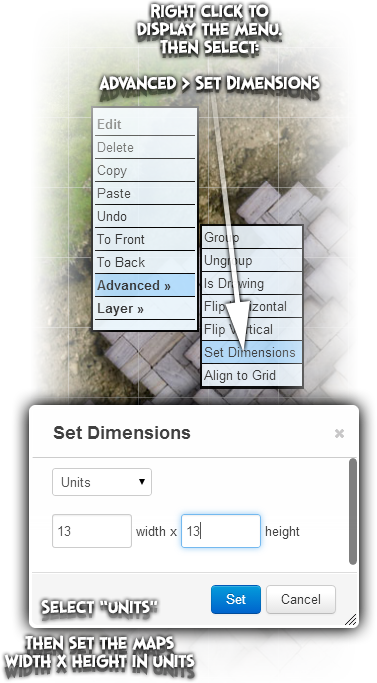 Roll20 uses “units” for the map grid. Thus one unit is one character square, since we use the old d20 3.5ed character square system (each character square being 5 feet square). To work out how many units each map is, look in the top left corner of each map. There you will find the measurements of the map, total width and total height. Simply divide those measurements by five to figure out the total units for the maps height and width. 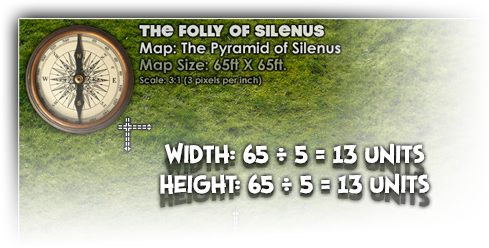 So, to set-up the Folly of Silenus Map: The Pyramid of Silenus, we need to create a page in Roll20 that is 13 units square, with each unit configured to a measure of 5ft square. To do this, open the Page Toolbar by clicking on the tab at the top of the Roll20 interface. Next you will need to create a new page by clicking on the Create New Page button, doing so will create a new blank page in the toolbar. Now you need to access the new page’s configuration menu. You do that by clicking on the small gear tab on the left side of the new page thumbnail. 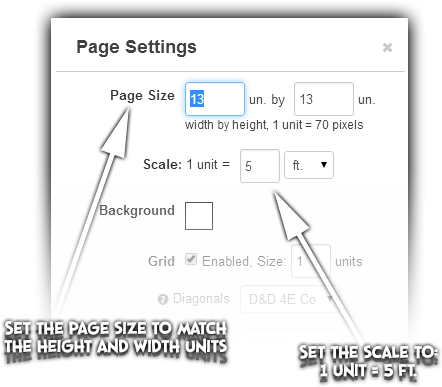 Within the Page Settings menu, you now need to set the Page Size in units. Using the example, our height and width should be 13 units high and 13 units wide. Next we need to set what the scale of a unit is, in the scale box enter the value 5, and select ft. from the pull down menu. Then save the settings. Ok now, the blank page is setup to accept the artwork. But when we place the artwork into the blank page, it will not be scaled correctly because we need to configure the artwork. After you drag’n’drop the map artwork from your Roll20 Library onto the blank page, right click on the placed artwork to display the popup menu. Within the popup menu select: Advanced > Set Dimensions. Doing so will display the Set Dimensions menu, within this menu select “Units” from the first drop down menu. Next, set the height and width to the unit size of your map. Then press set, doing so tells the Roll20 system how to scale the map in units so that it matches the units of the blank page. All you have to do from here, is drag the map artwork so that it’s border matches the border of the page. This should be easy to do as the artwork edge should snap to the edge of the page. That is it! Click here to learn about using our virtual tabletop Tokens in the Roll20 App.